The nearshore and offshore regions running from the shallow coastal shelf to the intertidal zone are dramatic, tempestuous and extremely complex environments that offer the potential to reliably provide vast amounts of renewable energy to most coastal countries in one form or another. In order to harness this capability safely and efficiently, it is critical that we continue to expand our knowledge and understanding of the hydrodynamics of these environments. The ocean offers huge possibilities for generating electricity from waves and tides, and the UK is very well placed to exploit this form of electricity generation. Marine renewable energy is of particular interest in Wales, where the unique coastline offers significant capacity to generate marine renewable energy (MRE). The coastline here has areas with high tidal ranges that are ideal for tidal lagoons as well as fast tidal currents for tidal stream energy and regions exposed to substantial wave action, which are required for wave energy devices. The SEACAMS2 project is a collaboration between Bangor University and Swansea University that supports research and innovation in applications of MRE, climate change resilience and resource efficiency, and is partly funded by the European Regional Development Fund. Data, products and services resulting from the SEACAMS2 collaborative research in the Marine Centre Wales, home to the Centre for Applied Marine Sciences (CAMS), will be available to marine industries, government and scientific users and the general public via the Integrated Marine Data and Information System (iMarDis) that offers a single point of access. Figure 1: Acoustic transceiver and CTD package in buoy moon pool (photo: Martin Austin, 2018). Their data assists our understanding of how we can generate electricity from the waves and tides and how we can quantify that resource, help predict how this resource may vary in the future as a result of climate change, identify regions that are ideal for each energy type, and minimise the impact on the environment of this process of energy generation, including the effects of any turbulence on devices and the surrounding ecosystem. Ocean Scientific International Ltd (OSIL) worked with Bangor University to provide a network of three telemetered data buoys for the collection and measurement of oceanographic, meteorological and water quality data parameters around the coast of North Wales for the SEACAMS2 project. The buoys were required to provide a data link from existing packages of seabed-mounted instrumentation located directly below the platforms to an instantly accessible web portal, from where the data can be integrated into existing CAMS IT infrastructure and disseminated to the public via iMarDis. Deployed for an initial period of two years, the buoy network will remain in-situ for at least a further year as a result of a no-cost extension to SEACAMS2 and could potentially remain deployed indefinitely if funding allows for a future extension. Figure 2: Seabed instrument package consisting of multiple acoustic instruments sampling hydro- and sediment dynamics from the benthic boundary layer to the sea surface (photo: Graham Worley, 2018). 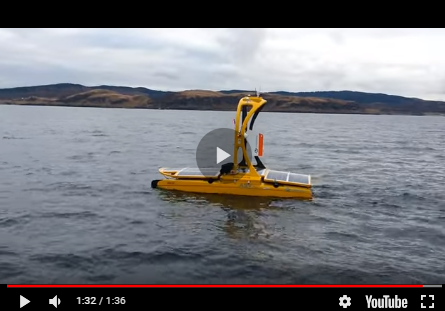 The benthic instrument packages are deployed in energetic and shallow nearshore coastal locations that are potential sites for energy extraction. Each is furnished with a range of Nortek equipment, including an AWAC directional wave and current profiler, an Aquadopp HR profiler to sample the benthic boundary layer for sediment transport and turbulence studies, and a Signature 1000 AD2CP current profiler providing high-resolution current and turbulence data. These coastal observatories measure: wave-driven currents; wave spectra; integrated wave parameters (period, frequency, amplitude, wavelength and speed); tidal currents; turbulence; water surface elevation and sediment dynamics. These readings allow the hydrodynamic profiles of the deployment locations to be studied in great detail to assess their feasibility for MRE developments and their optimal siting. Some of the instruments are self-logging and are retrieved at regular intervals to recover data, but others are real-time instruments sampling in bursts and provide NMEA data strings of wave parameters, in addition to 3D current speed at multiple elevations above the seabed, every 30 minutes. The data buoys interrogate the real-time seabed instruments using an acoustic modem to avoid introducing unnecessary cabling that could be damaged in the dynamic deployment conditions, and data from the sensors are received into the data logger that is integrated into the electronics system of each buoy. The buoys have also been provisioned for the mounting of an anemometer and a CTD, and additionally, report data from these instruments in conjunction with transmitting ancillary data from the onboard power system and sensors. The data is relayed via a dual telemetry system, comprising a GPRS modem, which can be used if there is sufficient network coverage at the installation locations, and an Iridium modem which is used in place of the GPRS modem if coverage is poor and transmits the data as Short Burst Data (SBD) messages. Cellular coverage could not be guaranteed in the deployment locations, so the synergistic telemetry solution from buoy to shore provides a highly reliable, low latency solution, which can accommodate the integration of various instruments with NEMA, RS232, RS485 and SDI12 outputs (amongst other industry standard protocols). Figure 3: Buoy deployment in Colwyn Bay from RV Prince Madog (photo: Martin Austin, 2018). The robust and stable 1.9m data buoys were selected for their high reserve buoyancy and their ability to endure harsh conditions and exposed coastal locations, but they require regular management checks like any other deployed equipment to ensure the functionality is not impaired. Easy access to the buoy power system and electronics for maintenance was provided by a secure service door in the top section, and the moon pool, which is formed by the central steel structure of the buoy and provides a protected area for the installation of surface instruments, can also be accessed through the top frame. The waterproof electronics housings and all cables were equipped with wet mateable subsea connectors to simplify in-field servicing. To ensure that the buoys are self-sufficient with respect to power during long winter months, OSIL developed a tailored power system comprising an array of high-power solar panels, a solar regulator and a battery bank fitted to each buoy top section. The mooring systems were designed for the specified locations to accommodate a wide variation in mooring requirements, including mean water depths ranging from 10-50m and tidal current speeds of 3.5+ knots. There is an emphasis on damping the effects of waves on the buoy and providing shock absorption in extreme weather conditions as these harsh Irish Sea locations see 6m tides and a maximum wave height of 7m with two sites exposed to the prevailing south-westerly winds, and one to northerly winds. Figure 4: Buoy service in Colwyn Bay (photo: Graham Worley, 2018). Each buoy was equipped with a 2-point catenary mooring consisting of a chain hung beneath the buoy to lower its centre of gravity and increase stability, nylon braid to provide stretch in the mooring and dampen the shock of waves on the mooring and buoy, and additional lengths of chain on the seabed to further reduce the effect of waves on the buoy. The mooring legs are secured with large clump anchors, and the watch circle alarm function, which OSIL engineers have programmed into the buoys to send an email alert via the telemetry system to Bangor University staff if a buoy moves further than a pre-set distance from its installation location, will doubly ensure the security of the buoys during their deployment period. The buoy network produced by OSIL in conjunction with Bangor University provides a durable, integrated, low-cost and reliable telemetered data link that contributes to a comprehensive understanding of the interactions of waves and currents, and the opportunities available in MRE. The knowledge gained from these studies can be extended to other regions and supports a broader understanding of the hazards, risks and changes in the coastal and marine environment. This increased awareness offers an opportunity to stakeholders to optimise the growth and sustainability of MRE with applications and benefits for the wider community. Cooperative research, development and innovation drives the improvement of products and services such as high-resolution tidal models, fine bathymetry and model visualisation tools that derive from such forums as the SEACAMS2 project, and facilitate interactions between researchers, policymakers and businesses in rapidly evolving technologies that are relevant to other industries and fields of research. Figure 5: Deployed buoy in Colwyn Bay (photo: Graham Worley, 2018).